The King Family (TV's first family of song) star in 4 of their swingin' 1960's musical television specials. Royal Entertainment Presented Family-Style! The first-ever release of The King Family's beloved 1960's musical variety TV specials unseen for over forty years. 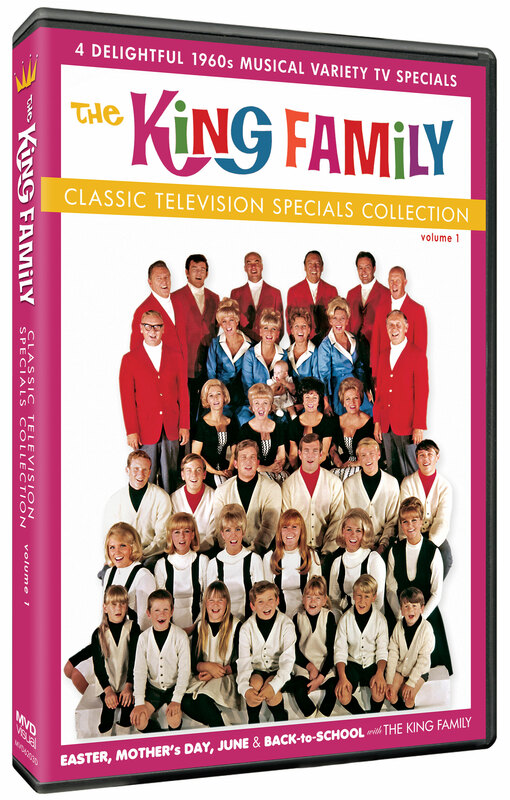 The King Family - classic TV's platinum-selling, multi-generational entertainment powerhouse starring Grammy nominees The King Sisters, guitar pioneer Alvino Rey, The King Cousins, Tina Cole (My Three Sons), and The King Kids - sing and dance their way through these showstopping musical holiday celebrations in this 2 Disc set. 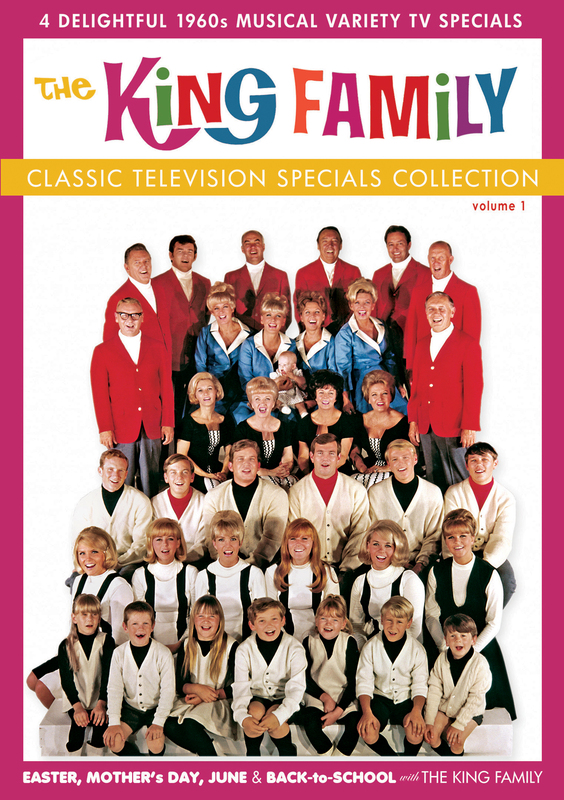 "The King Family Classic Television Specials Collection Volume 1", encompasses four of the family's most popular TV hits, "Easter", "Mother's Day", "September/Back to School" (all from 1968) along with "June with the King Family", first broadcast in 1969. Digitally remastered from the original tapes, these musical salutes to the holidays are presented in classic living color, along with a treasure-trove of bonus performances, home movies and much more. These lavish full-scale productions feature a cavalcade of hits sung by the talented Kings backed by the Big Band sound of the Alvino Rey Orchestra and capture the King Family both "on location" at Southern California's beautiful Descanso Gardens & The Los Angeles Arboretum, as well on the sound-stages of legendary MGM Studios. Following the success of their hit ABC-TV series, "The King Family Show," the Family launched this series of popular monthly syndicated TV specials which would go on to spawn a show-business phenomenon. Over the next two decades the Kings starred in 17 specials, released 6 top-selling albums, headlined a second TV series, and appeared in concert at the nation's top venues including The Hollywood Bowl. There was even a "King Family Day" at the 1964/65 Worlds Fair. Experience all the heartwarming singing, dancing, musical magic, and family fun in four wonderful hour-long specials starring TV's first "real-life" musical family -- the fantastic King Family. Lavish productions shot in unique Southern California locations such as Los Angeles County Arboretum, MGM Studios, Descanso Gardens and Bullock's Fashion Square Sherman Oaks. These specials were done with a lot of love, and it carries through to this nicely packaged two-disc set. Recommended.